Please excuse me while I rant. Part of my crankiness this morning is due to the abrupt shift forward of the clock, a misguided and arrogant attempt by our lawmakers to “save” time. Time, of course, is a very human invention. Daylight Saving Time is a very stupid, human invention. It’s time to dump it. It was also repealed the following year because DST was universally hated. The idea was brought back nationally during World War II, but was applied inconsistently during other periods. Which is why the transportation industry lobbied for a permanent national law. However, instead of doing the sensible thing, telling everyone to cut out the practice altogether and let nature do it’s thing with regard to sunrise and sunset, Congress passed the Uniform Time Act in 1966. Anyway, I’ve ranted about this several times in the past and you can read those entries for more reasons why this concept needs to die. A few years ago the Washington Post also published 5 Myths About Daylight Saving Time, which includes this little additional bit of nomenclature stupidity to add to the mix. So, there’s the solution. Next November, just leave the damn clocks where they are and forget the whole illusion of “saving” time. I don’t care whether you choose to call it “permanent daylight saving time”, which sounds stupid, or “standard” time, which it would be. After one cycle, most people will just call it normal. Just like nature intended. Thank you for indulging my sleep deprived rant. Oh, and one more thing: the term is Daylight Saving, not savingS. At least get that part right. The cartoon is the first panel from the Sunday edition of Wiley Miller’s wonderful Non Sequitur. The rest of his story makes about as much sense as any justification for DST I’ve heard. 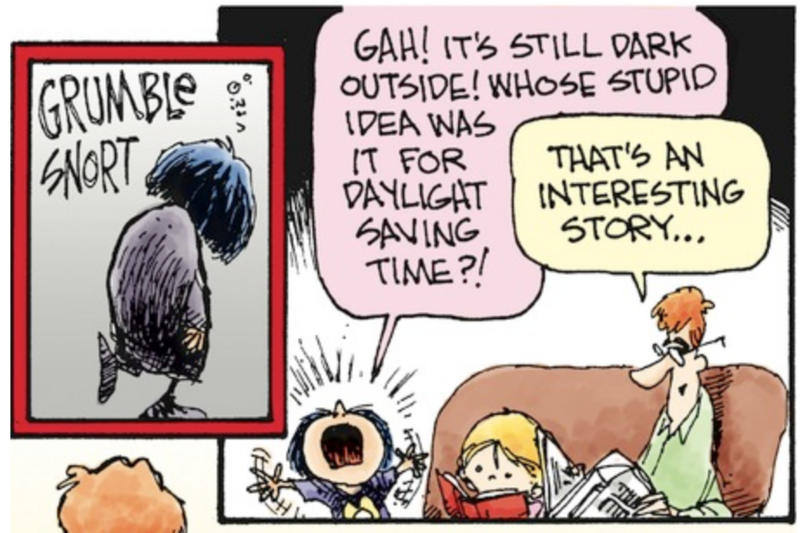 The Sunday Fox Trot take on DST is also amusing. I think using a part of the comic in this context would be considered Fair Use. 1. Wikipedia, as you might expect, has a very complete telling of Daylight Saving Time’s history in the US and the general controversy surrounding the concept. ← What’s Your Attitude Towards Science?